Phuket (Thailand) — February 8, 2019 (travelindex.com) — The Naka Island, a Luxury Collection Resort & Spa, Phuket awarded “Gold Level” Green Hotel Award at the 12th Anniversary G-Green award ceremony organized by Thailand’s Department of Environmental Quality Promotion, Ministry of Natural Resources and Environment. 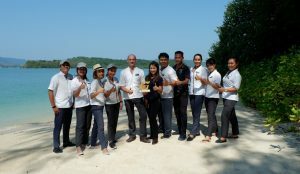 This prestigious award strengthen the resort’s sustainability and environmental policy in Thailand. The event was attended by government and industry leaders, hotels and hospitality organizations, international print and broadcast and is highly regarded among the global travel and tourism communities.